The beloved baby brand to produce a Peruvian Pima cotton clothing collection featuring the iconic baby gift character. RED BANK, N.J. (October 27, 2015)—Starting with Spring/Summer 2016, parents and gift-givers will have an exciting new way to welcome new arrivals thanks to the launch of Sophie la girafe by Kissy Kissy layette. The delightful pairing is the result of a 2-year licensing deal between parent companies Deliso S.A.S. and Tatiana & Company, which gives Kissy Kissy the exclusive U.S. rights to produce and sell baby clothes with the iconic character. The collection, which will hit stores in June, will include more than 100 pieces, including footies, bodysuits, converter gowns, pajamas and accessories. And each garment will feature the signature softness and durability that Kissy Kissy’s Peruvian Pima cotton provides. 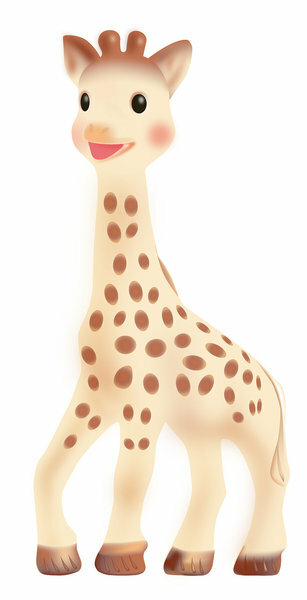 Sophie la girafe by Kissy Kissy will be distributed to better stores, specifically focusing on retailers that currently carry Kissy Kissy and welcoming many Sophie la girafe shops as well. The collection will include traditional layette pieces as well as towels and pajamas up to size 2. The groupings will include two prints as well as Kissy Premier pieces featuring hand embroidery, covering girls, boys and unisex. Tatiana and Company launched Kissy Kissy in 1997 to meet a need in the market for a traditional Peruvian Pima cotton layette line, offering a full range of coordinating apparel and accessories. The company was among the first in the United States to do so, and the brand is still No. 1 in the hearts and minds of moms around the world. Today, Kissy Kissy is carried in the finest department stores and specialty boutiques around the world and has a strong celebrity fan base that includes Drew Barrymore, Katie Holmes, Molly Sims, Celine Dion, Salma Hayek, Brooke Shields, Alyson Hannigan and Alec Baldwin. From wardrobe essentials to dressy options, the brand delivers timeless pieces in each division, including sweet looks in the Kissy Kissy line; bolder statements from Kissy Kissy’s Qt-Qt; christening apparel in Besos by Kissy Kissy; and embroidered and smocked garments from Kissy Kissy Premier.